Variations in the root canal morphology of the mandibular premolars have been frequently reported. One such variation is the C-shaped root canal configuration (C-SRCC). The pulp chamber of the C-SRCC is a single C-shaped orifice with an 180° arc or more and the root canal system may present either with a single, C-shaped canal from orifice to apex or with two or more canals below the C-shaped orifice. Although this configuration has been most frequently reported in mandibular second molars, there has been only one reported case in the mandibular second premolar. This case report, perhaps first describes the endodontic treatment of C-SRCC in relation to the mandibular second premolar. A 67-year-old male patient who presented with a non-contributory medical history reported to the department with pain on eating hard food in the left side of the lower jaw in relation to the lower left premolar. Past dental history revealed that 1 month ago, the patient had undergone caries excavation and temporization in both the mandibular second premolars. Extra oral examination revealed no pathologic signs. Intraoral examination revealed that the left mandibular second premolar (#20) had a temporary restoration and was slightly sensitive to percussion. 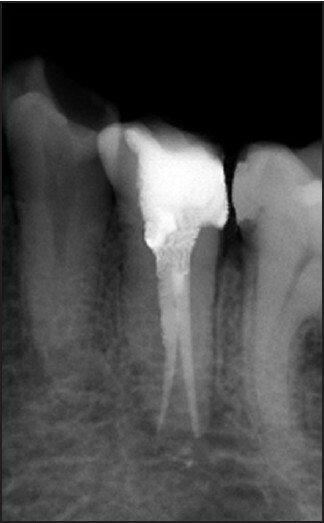 The tooth was non-responsive to electric pulp testing and cold testing, indicating a diagnosis of pulp necrosis. Radiographic examination of the tooth showed restoration approaching the pulp chamber with probable pulp exposure and widening of the periodontal ligament space. The second premolar also exhibited a rare anatomic feature, a C-shaped root with a central longitudinal groove [Figure 1]. 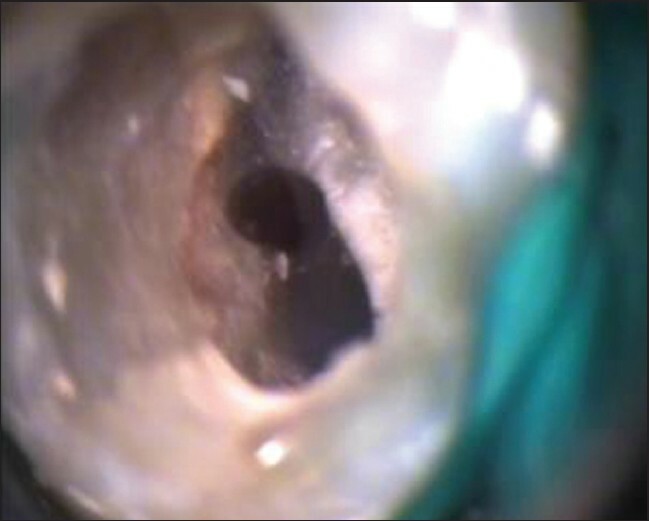 A central canal divided into two separate mesial and distal canals at the level of middle-third of the root and exited as separate apical foramina. Tooth #20 was diagnosed with the chronic apical periodontitis secondary to pulp exposure. An informed consent of the patient was obtained and the tooth was prepared for a single visit non-surgical endodontic therapy. After administration of local anesthesia and placement of rubber dam, access to the pulp chamber was gained. The conventional ovoid bucco-lingual access tooth preparation was modified for access to mesial and distal canals of the mandibular second premolar under the dental operating microscope (DOM). Examination of the floor of the pulp chamber under the DOM revealed, a C-SRCC dividing into two canals at the level of middle-third of the root [Figure 2]. Initial instrumentation was performed with #10 K file under irrigation with 5.25% of sodium hypochlorite. The working length was estimated using the electronic apex locator and later confirmed by a radiograph [Figure 3]. Cleaning and shaping was meticulously planned and performed as C-SRCC meant that a groove was present on the root. Copious irrigation with generous volume of 5.25% sodium hypochlorite was carried out. Mesial and distal canals were prepared using Anti curvature filing technique with K files. The mesial and distal canals were prepared until size 35. After shaping the canals, 5.25% sodium hypochlorite was agitated for 1 min using an ISO size 15 K-type ultrasonic file mounted on ultrasound generator using the passive ultrasonic technique. 17% Ethylenediamine tetra-acetic acid was used to remove the smear layer. 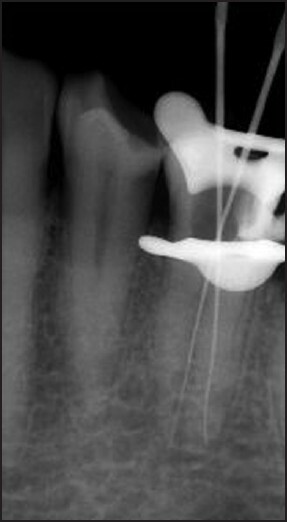 The canals were dried thoroughly and a hybrid technique of root canal obturation was followed. The sectional method of obturation was used to obturate the mesial and distal canal spaces until the level of canal bifurcation and the C-SRCC was later obturated by using the thermoplasticized gutta percha technique. The tooth was then restored with a temporary restoration [Figure 4]. This case report highlights the endodontic treatment of the left mandibular second premolar having C-SRCC with bifurcation into two distinct canals: Mesial and distal, using a DOM. The development of a C-shaped root formation has been attributed to the failure of Hertwig's epithelial root sheath to fuse onto the buccal or lingual root surface. To the best of the authors knowledge, the only reported case report of a C-SRCC along with the configuration type in a mandibular second premolar is of an extracted tooth using micro computed tomography evaluation. The C-SRCC was seen to be extending through the majority of the mid-canal system, which terminated in a single foramen, an uninterrupted with no separation or division [Melton's Category I and Fan's C1 unlike the present case, which showed canal bifurcation. The C-SRCC is more common in Asians than Caucasians  and the present case report is of a patient of Asian origin. In an in vitro study by Sikri and Sikri  of mandibular premolars, nearly 10% incidence of C-SRCC in mandibular first premolars (n = 112), but none were reported in the mandibular second premolars. It should be noted that the ethnic background of this case report is similar to the population in the above study group. No case reports describing a C-SRCC in a mandibular second premolar have been identified in an extensive review by Cleghorn et al.,  in which published studies of root and root canal morphology of mandibular second premolars (n > 7700) including individual case reports were thoroughly reviewed. Melton classified C-SRCC  of mandibular second molars on the basis of their cross-sectional shape and applying this classification, tooth #20 was a Category III; subdivision II: C-shaped orifice in the coronal third that divided into separate mesial and distal canals in the middle third of the root till the apex. Fan et al. presented an anatomic classification by modifying Melton's classification into five categories [C1-C5] and the tooth #20 was probably a C3 category. The above classifications can be applied to cross sectional images, but since 3-dimensional (3D) radiographic technology was not used and axial images of the tooth were unavailable the type of category could not truly confirmed. According to Fan's radiographic classification of C-SRCC it was a type II: conical canal with a radiolucent line separating mesial and distal canals, which appeared to continue on their own pathway to apex. All the necessary steps to locate, clean, debride and obturate the complex root canal anatomy were implemented. Aggressive instrumentation would cause perforation and hence passive ultrasonic activation using 5.25% of sodium hypochlorite was carried out to necessitate the flow of irrigant into the un-instrumented complex anatomy to maximally debride the root canal system. The large area of the canal space and niches in the connecting fin areas made instrumentation in the entire portion of the continuum difficult and hence ultrasonic irrigation procedures attained more significance. Thermo plasticized gutta-percha obturation technique was followed as studies  have shown that this technique leads to better flow of gutta-percha into all the areas of the complex anatomy of the C-SRCC. 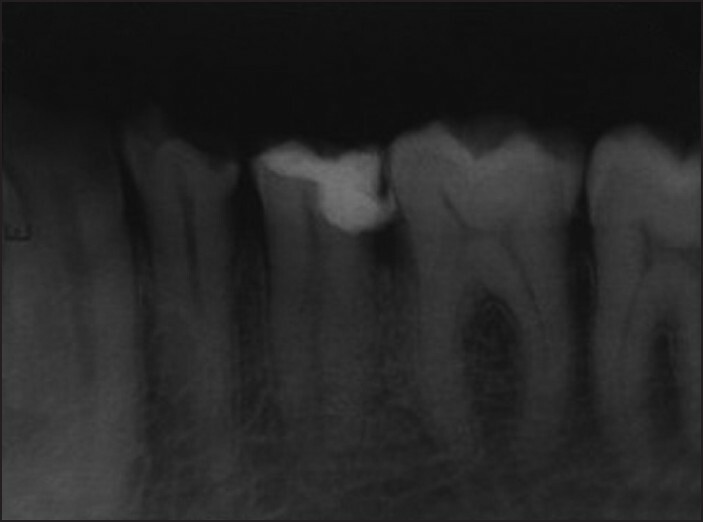 The recent case reports have used 3D imaging techniques, along with the DOM thus making an accurate diagnosis of the root canal configuration. This in turn has led to successful endodontic management of these cases. This case report attempts to address and report the first endodontic management of a C-SRCC in mandibular second premolars. Careful negotiation of the canals, meticulous disinfection of root canal is important in carrying out successful endodontic treatment of a C-shaped canal configuration. 1. Cleghorn BM, Christie WH, Dong CC. The root and root canal morphology of the human mandibular second premolar: A literature review. J Endod 2007;33:1031-7. 2. Cooke HG 3 rd , Cox FL. C-shaped canal configurations in mandibular molars. J Am Dent Assoc 1979;99:836-9. 3. Vertucci FJ, Haddix JE, Britto LR. Tooth morphology and access cavity preparation. In: Cohen S, Hargreaves KM, editors. Pathways of the Pulp. 9 th ed. St Louis: Mosby; 2006. p. 227. 4. Cleghorn BM, Christie WH, Dong CC. Anomalous mandibular premolars: A mandibular first premolar with three roots and a mandibular second premolar with a C-shaped canal system. Int Endod J 2008;41:1005-14. 5. Sikri VK, Sikri P. Mandibular premolars: Aberrations in pulp space morphology. Indian J Dent Res 1994;5:9-14. 6. Melton DC, Krell KV, Fuller MW. Anatomical and histological features of C-shaped canals in mandibular second molars. J Endod 1991;17:384-8. 7. Fan B, Cheung GS, Fan M, Gutmann JL, Bian Z. C-shaped canal system in mandibular second molars: Part I - Anatomical features. J Endod 2004;30:899-903. 8. van der Sluis LW, Versluis M, Wu MK, Wesselink PR. Passive ultrasonic irrigation of the root canal: A review of the literature. Int Endod J 2007;40:415-26. 9. Bowman CJ, Baumgartner JC. Gutta-percha obturation of lateral grooves and depressions. J Endod 2002;28:220-3.